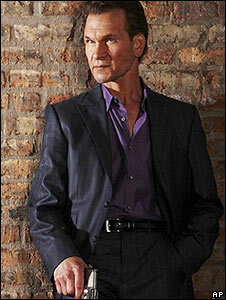 Actor Patrick Swayze, who has pancreatic cancer, has admitted he may survive only two years. Speaking in his first US TV interview since he was diagnosed with the disease, the Dirty Dancing star said he was "scared" and "going through hell". The 56-year-old refused painkillers while working on new TV drama The Beast, and missed only a day-and-a-half of the show's tough filming schedule. He also denied being on his deathbed and "saying goodbye to people". "Am I dying? Am I giving up? Am I on my death bed? Am I saying goodbye to people? 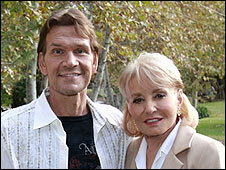 No way," Swayze told TV interviewer Barbara Walters. But the star, whose other screen credits include romantic movie Ghost, admitted that he still asks himself: "Why me?" Swayze added that he wanted to survive long enough for a cure to be found, but said that beating the disease for five years was "pretty wishful thinking". "I keep dreaming of a future, a future with a long and healthy life, not lived in the shadow of cancer but in the light," he said. The actor added that people thought he was "out of his mind" to shoot the new detective series while undergoing a rigorous and experimental treatment - and without pain relief. The Beast is due to debut on US cable channel A&E next week. "When you're shooting you can't do drugs... 'cos it takes the edge off your brain," said Swayze. He was diagnosed with the disease early last year, and in December issued a statement denying US tabloid reports that he was close to death. He said that he was winning his fight against cancer and called the stories "lies and false information".